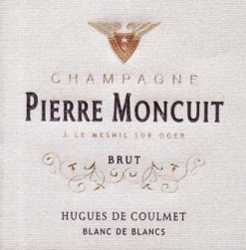 In 1889 Pierre Moncuit and his wife, Odile Moncuit-Delos, established the house of Champagne Pierre Moncuit. Since 1977, Nicole Moncuit has managed the vineyards and made the wine, while her brother Yves has managed the sales. More recently, Nicole’s daughter Valérie has been actively assisting in the cellar. Mesnil lies smack in the middle of the Côte des Blancs and is its most celebrated village, in no small part because of the vintages of Salon Champagne and the single-vineyard Clos du Mesnil, owned, of course, by Krug. The wines of Mesnil are known above all for steely elegance and minerality, and those from chez Pierre Moncuit—which has some of the oldest vines along the entire Côte—superbly reflect these qualities. The uniqueness of champagne stems from the combination of the region's terroir and the vines and grapes that can only be grown in specific plots of land within the Champagne Region. These characteristics, combined with specific process of champagne winemaking, “method champenoise”, are strictly regulated and can only exist in one place in the world to cultivate one, unique sparkling wine. The champagne making process has been carefully developed over hundreds of years. In transforming the fruits of the unique terroir of the region into champagne the method covers everything from careful vine growing to the special cork placed into the bottleneck. The Appellation "Champagne" allows only three grape varieties in the production of champagne: Chardonnay, Pinot Noir and Pinot Meunier.